Article published as part of the Linkedin Influencer program on 8 March 2016, International Women’s Day. The movement was launched one month earlier. Co-written by Natacha Quester-Semeon, entrepreneur and spokesperson for #JamaisSansElles and Gilles Babinet, entrepreneur (Captain Dash), Digital Champion representing France at the European Commission. The digital revolution offers an historic opportunity to reform and improve the world of work. That which in generic terms is called “digital transformation” is a true cultural and societal mutation that changes the codes and modifies the organization of work, especially the relationship between employees and firms, as well as between companies and customers. This context represents a tremendous opportunity for gender equality and diversity in companies. So, at the instigation of CEO Sébastien Bazin, the Accord Hotels group created a “shadow comex” consisting of twelve executives, women and men under the age of 35 and of seven different nationalities. Accord Hotels faces AirBNB and TripAdvisor competition, so it is crucial to understand the conceptual software of these former startups who became unicorns in order to survive and compete better with the competition. As Sébastien Bazin put it, “We must embrace the revolution not endure it! “. A few weeks ago, Isabelle Kocher could have become the president of a CAC 40 company – which would have spared us that terrible picture of a meeting with Iranian President Hassan Rohani who was welcomed by the Medef in an assembly composed 100% of men, and very widely discussed on social media! However, at ENGIE’s a 49-year-old female executive was deemed too “inexperienced” to take the reins of an energy group. Do we really think that by walking backwards we can face a world that is moving and changing so quickly? We have to adapt and do so without losing ourselves. It is not only a question of humanism or feminism: it is also a question of pragmatism. We have everything to gain! 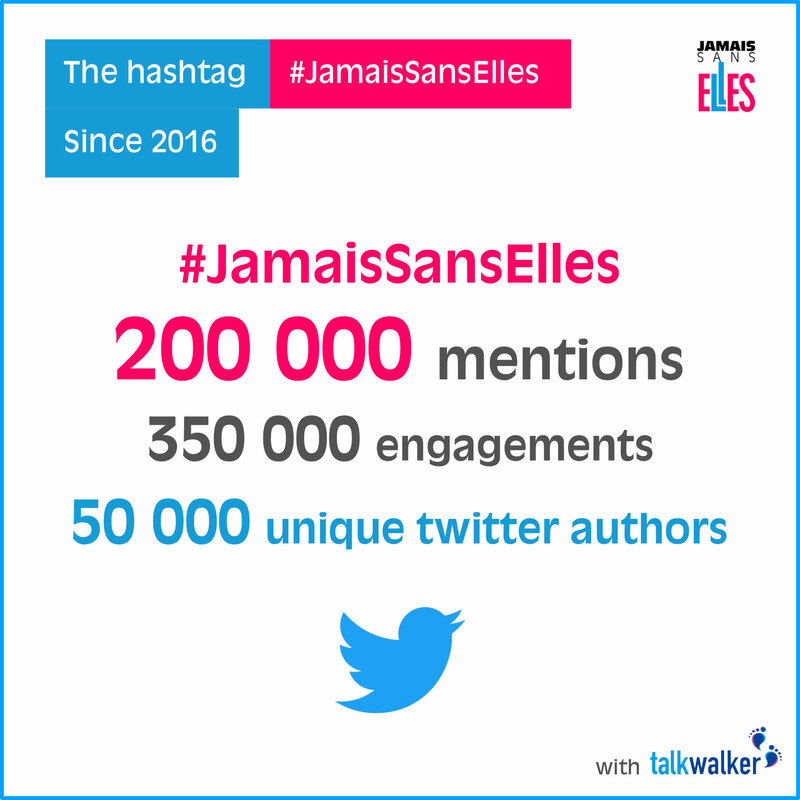 The hashtag #JamaisSansElles has already reached more than 20 million people (in 5 weeks). That is why we have launched the appeal #JamaisSansElles, which has turned into an authentic movement. The Gentlemen’s club, chaired by Tatiana F-Salomon and Guy Mamou Mani, brings together some thirty humanist entrepreneurs and leading figures from the digital world, such as Benoit Thieulin, Henri Verdier, Sylvain Attal, Benoit Raphael, Jean-Michel Blanquer, Claude Posternak, Alexandre Jardin and ourselves. What are the signatories undertake to do? 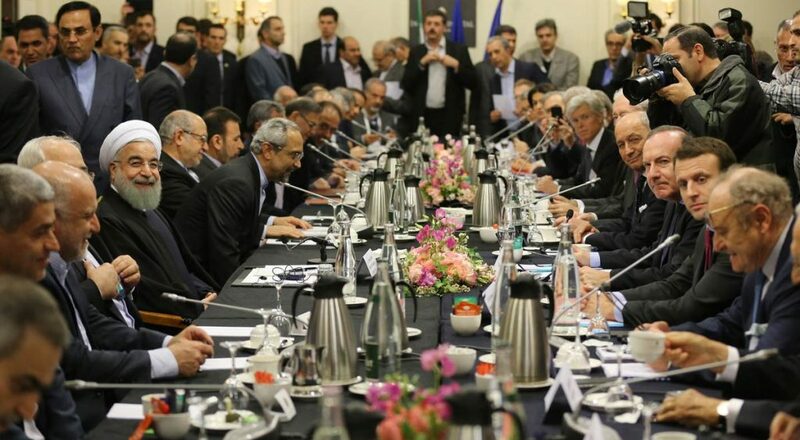 Something very simple: to no longer participate in a conference or public event where women are absent. Today, they are joined by more than 100 executives such as Nicolas Sekkaki, CEO of IBM France, Damien Viel, CEO of Twitter France, Stéphane Richard, CEO of Orange, Etienne Gernelle, Director of Le Point, Louis Dreyfus, Chairman of the Executive Board of Le Monde, Jacques-Antoine Granjon, CEO of Vente-Privée.com, Thierry Taboy, Vice President of Orange Group RSE, Dominique Delport, CEO of Havas Media Group, Nicolas Bordas, Vice President of TBWA / Europe, four members of the new National Digital Council, of which two vice presidents, and at last of all three mayors, one of whom is Alain Juppé. The commitment is supported by a women’s council among whose members are Laurence Parisot, Nathalie Kosciusko-Morizet, Axelle Lemaire, Isabelle Weill and Michèle Fitoussi. As soon as the appeal appeared, the hashtag #JamaisSansElles became a trending topic on Twitter. This co-elaborative movement has had a wave effect on social networks and in just five weeks the hashtag has reached more than 8 million people on Twitter. 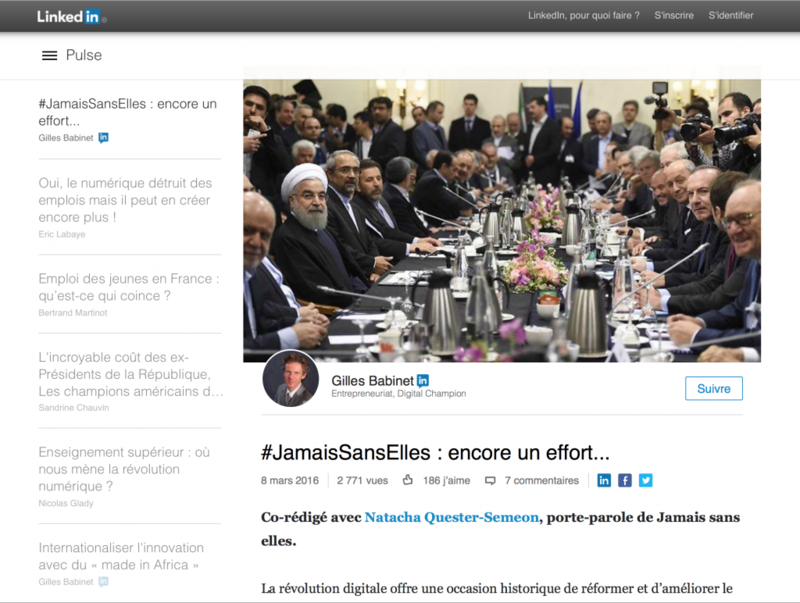 Every day, everywhere in France, men and women use of the #JamaisSansElles hashtag by posting comments or photos to inform, alert and promote subjects related to gender equality : the presence or absence of women in conferences, information about professional equality, etc, etc.. These conferences, events and managerial positions in large companies from which women are absent seem now to be relics of the past. What still appeared to be more or less natural yesterday, today simply seems no more acceptable to an increasing number of people, both on stage and in the audience. And there are reasons to believe that they will soon become a majority. This commitment is also the result of rigorous and comprehensive work, led in particular by Girl Power 3.0, founded in 2006, and subsequently carried out by many other women’s clubs and networks that have developed throughout France. If our country is not willing to give a lot more room to women, young people and disruptors, it will not be in a position to face the digital revolution. It is not a question of imposing nor even opposing, but a question of collaborating. What is new is that thanks to the influence of some female leaders and respected women in the digital arena, men have become aware of what is at stake with gender equality. It is no longer women, but men who are demanding the presence of women. And that changes everything ! It is an extraordinary lever that is really shaking things up. This fact was very quickly understood by conference organizers and some are already working with the association in order to receive the #JamaisSansElles label. To help them, the association is also working on the creation of a qualified network of women able to speak on a wide range of subjects, with all the legitimacy and relevance their competence confers on them, as well as their experience and, sometimes, complementary vision. On the other side of the Atlantic, the UN launched the 10x10x10 pilot program as part of the “He for She” campaign. Ten governments, ten firms and ten universities are involved in a program to define global standards for gender equality and their practical application. Among the companies involved * are Twitter and the Accord Hotels Group, which is committed to achieving equal pay by 2017. To create and innovate, it is necessary to open the doors and mix with all those who have talent and ideas, whatever their profile. It is time to stop making the new with the old, but rather the new with the new. However, women must also become more self confident, and put an end to “impostor syndrome”. Especially, since it has been demonstrated that women manage companies better than men. So, it is at least as much a question for men to make space for women, as it is for women to take the space they legitimately deserve. This will be the end of the “glass ceiling”. Our country is condemned to change, or doomed to disappear. French society is in a state of crisis, which includes a crisis of confidence as regards politicians and journalists. But the French people trust entrepreneurs. That is why digital companies, actors of change, and all those that are part of digital transformation, have a key role to play. No one can ignore any longer that there are new job opportunities in the digital world and that all these “new trades” are recruiting in huge numbers: this is where today’s and tomorrow’s growth lies. At the same time, as citizens, we can all help strengthen what may become a genuinely new momentum for our country. We have to believe in our values and well-being in the workplace, in living together made better. There is still a long way to go to establish equality between men and women, but we can create together to do so. We add that it is high time to re-enchant France ! * AccorHotels, Schneider Electric, Barclays, McKinsey & Company, Twitter, Vodafone Group Plc, Koc Holding, PwC, Tupperware Brands et Unilever.